Understanding how manufactured homes are constructed can help you remodel or modify a home. This is especially true when you have to replace the flooring or move walls in a mobile home. Knowing the construction methods that are involved, and the order of construction, can help you plan your project better and save money. Both single wides and double wides (which are basically just two single wides) sit on a steel chassis. Steel beams with slight curvatures are welded together to create a cambered chassis. This is done to help even out or distribute the weight of the home. These curves are barely noticeable but are vital to a strong manufactured home that can withstand vibrational forces and transportation at 55 mph. The camber or curve of the steel chassis helps the home absorb shocks and distribute weight more efficiently. The best chassis are built with American steel. Cheaper Chinese steel is used in a few builders – try to stay away from those if you have a choice. The ‘side to side’ beams have outriggers on the ends. Outriggers are the tapered edges that may or may not go to the very edge of the home. Cheaper manufactured homes will not have outriggers that go to the very edge of the home. Outriggers that go to the very edge are better because they hold the weight of the walls and the roof better. If the outriggers aren’t strong enough, or doesn’t extend out far enough, the home’s perimeter walls and roof can sag. Besides the chassis and roof-down structural integrity, manufactured homes are built much like site-built homes. Once the chassis has been built to specifications, the builders will use a jig or template to built the floor joists from 2x6s or sometimes 2x8s for the higher quality homes. Palm Harbor homes uses computer aided design programs to help design their floor joists for each model. The heating and cooling vents, plumbing lines, and electrical cables will be be installed through the floor joists. In some models, the ductwork and electrical will be ran through the roof trusses. Next, the subflooring and floor covering will be laid. Walls are built using wood boards called studs. Studs are the vertical boards and are normally 2″ x 4″ and spaced every 16″ in a manufactured home. That’s what the term 16″ OC, or ‘on center’ means in construction lingo. Better quality manufactured homes will have 2×6 studs and more affordable homes will have 2x3s. State laws and wind zones will determine how your manufactured home is constructed. Interior walls, sometimes called partition walls because they separate space and have no load bearing qualities, can be 2x2s and spaced 24″ apart. Walls around doors and windows are built differently to distribute weight down the sides of the rough opening. Structural headers are used above the doors and windows to reinforce the area. Oftentimes trimmer or king studs will be used (sometimes both but not as often). The bottom plate of an interior wall is nailed into the floor joists. The floor and the roof will sandwich the walls to create a structurally sound wall. The perimeter walls of a manufactured home is attached to the floor joists using nails and 26 gauge metal straps as shown below. These are also called hurricane straps. The perimeter walls are attached to the roof trusses using metal straps and nails, as shown below. If your manufactured home’s roof truss sits completely upon a top plate it usually indicates a load bearing wall. In reality, double wides are just two single wides. Each piece of a double wide has its own integrity and strength but together it creates an even stronger home. In the image below, you see one half of a double wide that has the interior and perimeter walls installed. Notice there is no roof, yet. Roofs are built separately from the rest of the home and installed after all interior work has been done. Once the roof is installed over the walls it will create a strong web of structural integrity. Some manufactured home builders do things a little differently. Some brands will put the roof on first and then add the exterior sheathing, others will add the sheathing on before the roof. Jacobsen Homes does the latter. Jacobsen Homes released a video on Youtube that shows their manufactured home construction process. Of all the videos I’ve watched they seem to call out other brands more often for cutting corners or using cheaper materials – I enjoy that. Exterior sheathing should be OSB or plywood. There is a product petrochemical product called Thermo-Ply. It’s cheaper and doesn’t seem to withstand the elements as well. We have added several of the top manufactured home builder’s construction videos below. This should make it easy for you to see how each company differs. Remember, though, a few of the brands below are owned by the same corporation so there really isn’t much of a difference. Also, keep in mind that these brands are showing their best models in these videos and therefore their best construction. Most models that builders offer will not have the materials mentioned. If you want to visualize a double wide’s building process, this image should help you. I found it at Frey’s Mobile and Manufactured Home Sales website. 1. 2×10 #2 SPF or better floor joists on 16″ centers. 2. Perimeter heat with wall mounted registers and boots. 3. Shaw Acclaim 16 ounce casual texture carpet with 5 pound rebond pad. 4. 2×6 Stud SPF or better placed on 16″ centers. 5. 2×10 headers above all windows and doors. 6. 7/16″ OSB exterior sheathing. 7. R-19 Owens Corning Fiberglass wall batt insulation. 8. 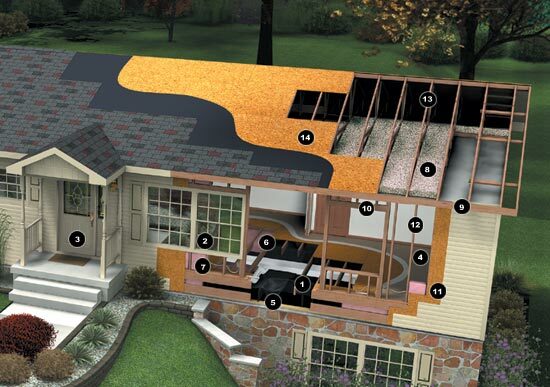 R-33 Cellulose Roof Insulation. 9. Optional 7/12 roof pitch with 50 or 70-pound snow load. 11. 7/16″ OSB exterior roof sheathing. 13. Full-finish drywall throughout the home. 14. Dual pane vinyl, single hung – single tilt windows. 15. 36×80 vinyl clad steel insulated 6-panel door with storm front and rear. Learn about the 3 levels of quality and price here. Knowing how manufactured homes are constructed is smart for those looking to remodel an older mobile home or buy a new manufactured home. Over the years, the manufactured home builders have tweaked their building processes down to a fine science and the quality of the homes has increased significantly. Building a home in a factory is a safer and far more affordable method of home construction. Advanced computer-aided design, specialized machinery, and tight inventory control has allowed brands to build manufactured homes at half the cost per square foot as a site-built home. Constructing a home inside a temperature controlled factory with well-trained employees that know they will have a job tomorrow creates a higher quality product. People that work regular shifts is the best all-around method for home construction. We had to redo the roof asap after buying our ’88 double wide 3 years ago. Because of the weight of the design, removing the old shingles was mandatory per local building department. (There’s a vented space between roof sheathing and new metal roof to facilitate removal of heat. My husband is a craftsman, thankfully, and he’s done many improvements to this home. He’s removed the siding to add more insulation and was shocked to find no wood sheathing! Thin paper – with multiple holes & tears -over insulation and inner wall board. Looking forward to a reduced electric bill. I bet your home is gorgeous! I’m always looking for homes to feature (hint, hint). I’ve seen a ton of homes that didn’t even have thin paper – it was just studs, insulation, and vinyl siding nailed to the studs! So many home buyers just don’t know to ask about sheathing and framing and flooring material, unfortunately. An extra $1000 in upgrades at purchase would save them thousands over the years but they don’t know. Hopefully, we’re educating home buyers a bit with every article. Thanks for commenting! I have a 1990 Skyline Birchfield 14 by 70 Mobile Home. We want to hand things on the walls like mirrors and photos. Do you know how far apart the studs are set? 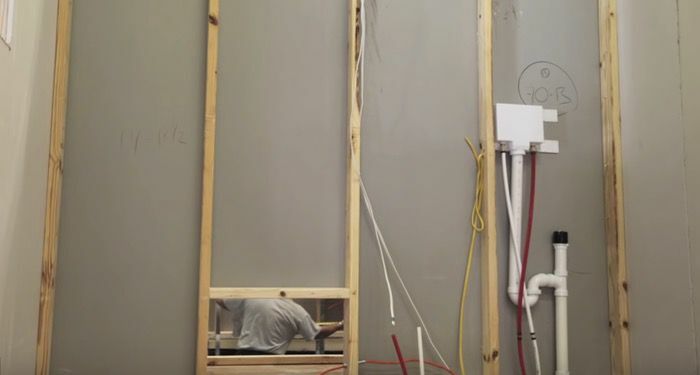 It depends but where the seams are for your wall panels is a good starting point. From there (4′ wide) you can start knocking on the walls you will hear the difference when you knock over a stud. It’s not as hollow sounding. There are stud finders at Lowe’s for about $20 too. There is a trailer which was for rent in a trailer park, it is a mess now & owner wants to get rid of it. I want to take it apart, move the parts to my property, & rebuild it… But better. I have worked in construction before, now doing research on my target to see how best to accomplish it. I love the idea of giving new life to an old mobile home but I’ll be honest, I wouldn’t try to take apart an old mobile and rebuilt it. If it can’t be moved via chassis it will likely be more trouble than it’s worth. By the time you take it apart, haul it, and rebuild it you could buy a small single wide or park model home or even a kit home and put it together. If the home was a low-level model with small studs (2×3 on 24’s) and mdf or particle board the salvaged materials won’t be worth the effort, time, and cost involved. Of course, I haven’t seen it or know exactly what you have planned so my opinion is likely not worth much..Best of luck to you and if you do this PLEASE take lots of photos of the process. I’d love to be proven wrong! I just purchased a ’79 DW beach house! Super excited to turn it into my beach cottage! I’ve done a dozen remodels on regular homes so I’m familiar with structural needs, but when it comes to a DW ….I’m completely green! Can walls be moved or omitted to create a open liv/din/kitchen concept? The metal roof has a small leak, how can I get up there to seal the leak? Can metal roof be walked on?? Thanks and I ABSOLUTELY love your site. ..I haven’t left in in 3 days! I’d love to submit my before/afters (once I’m done)! Thank you so much for the kind words! I’m tickled that MHL has been useful for you! You can walk on your homes roof but you must stay on the support beams/joists/truces. Thanks so much for reading Mobile Home Living! I appreciate you! I am buying a 1983 Mobile Home 934sq ft. Needs work…. I enjoy redoing things in side but know EVERY LITTLE about sliding, a/c/heat, pipes…:( and I am 63 and this will be my final home. So I want to do it right but on a low budget. Any information you could send me I would appreciate it. I know the roof and the sliding needs to be worked on first.. The sliding in several places looks bad and falling off. I don’t want it to look like a Mobil Home. I like to think outside the box. I think you may get some good ideas by just looking through the Repair section of this site. There’s a few articles on siding and roofing, and even plumbing too! If you have any specific issues just let me know and I’ll do my best to help. My direct email is [email protected]. Thanks so much for reading MHL! Good luck! When we were thinking of buying a NEW manufactured home, we visited the Fleetwood plant in Oregon. They had half a dozen homes in various stages and it was a really interesting tour. A little off-topic for this thread but housing prices seem to be going up here in Western Washington. We bought this house in summer, 2012. The house behind us (also a manufactured home) was just listed by HUD for twice the amount of our house. The lot sizes are the same; our neighbor’s house is about 300sf larger than ours; it doesn’t have a garage and our garage is 3-car with a loft. We have a 10×28-ft front porch and a 400sf covered patio. Their house has neither. Good news for the economy but, if you’re thinking of buying, now is the time. That’s certainly good and bad news, Suzanne, and you’ve proven that manufactured homes do appreciate, which is something a lot of people don’t know. Thanks so much for sharing with us! I had a friend that worked in a manufactured home factory down in NC and they told me a lot about the process though I had never seen it in person until I got youtube and was able to watch videos. I’d love to go visit one someday though. Thanks so much, I appreciate you taking the time to comment! That’s a question that needs to be answered by someone that has inspected the home. There are so many factors at play (framing or stud size/condition of the roof/pitch of the home/age, size and design of the home, etc.) Sorry, I can’t be any help. Usually a professional will come out and do free estimates and they will be able to tell you whether your home can handle a second set of shingles.